Plumbing, FishHawk, FL | A Step Above Plumbing Inc. Plumbing, FishHawk, FL | A Step Above Plumbing Inc.
We work with both commercial and residential plumbing problems in FishHawk, FL. 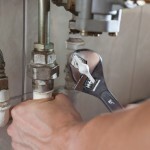 Any small problem can escalate out of control in a short amount of time, and plumbing problems are no exception. Even small plumbing problems, if left unrepaired, can turn into larger problems that cause damage and potentially cost even more to resolve. There are some small plumbing problems that you may be tempted to fix on your own. Of course, you can check your slow draining tub for hair and remove it or try plunging that clogged toilet, but before you pour harsh chemicals down the drain, think twice. They can easily damage your pipes and cause problems that will be very costly to repair at a later date. If you know you have a plumbing problem on your hands, the safest bet is to turn to us at A Step Above Plumbing Inc.
We have over 10 years of experience in the FishHawk, FL area. We work with both commercial and residential plumbing problems, spanning from drain repair, dripping faucets, pipe repair and installation to clogs and running toilets. Whatever your plumbing needs may be, we’ve got you covered. With our hours starting at 7am and appointments available on weekends, we are certain that we will find a time that works best with your busy schedule. We also pride ourselves on sticking to our appointment times; we don’t want to keep our clients waiting. Give us a call today for more information on how we can help you, and remember, the sooner you get that plumbing problem resolved, the better.